Project obstacles and solutions: The Carson residence in Evansville, Indiana hired A&S Construction to build a textured concrete exterior to their home. The project included a driveway, pool deck, two patios and an outdoor kitchen. The concrete was built with radiant heat exchangers in the slabs to enable the outdoor space to be used year round. This project used 264 yards of concrete and was completed over 11 months. 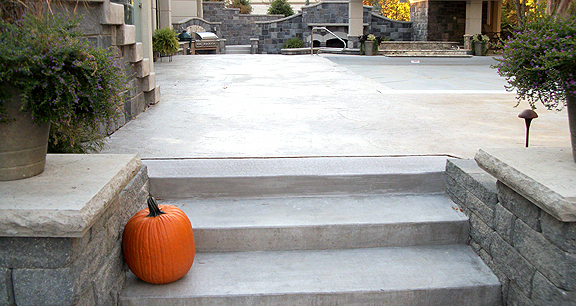 It was important that the color of the concrete did not fluctuate across all of the surfaces. IMI supplied imix Spectra colored concrete to the job. The color was integrally mixed in the truck, so the concrete was one uniform color coming out of the shoot. Two different colors were used. A&S then used a charcoal release to add texture to the surface. This project won the 2010 Outstanding Concrete Achievement Award from the Indiana Ready Mix Concrete Association. For more information on imix Spectra, click here.